One of your sister churches, First Church Somerville UCC, where I have pastored since 2003, has enjoyed a remarkable degree of growth during the last decade: from 30 to 150 people in worship (351 on Easter!). Our pledges have nearly sextupled—multiplied like rabbits. I would guess that 80% of our people are under age 50, that 60% are under 30. Yes, we have actual twentysomethings in our church: many of them. It wasn’t one thing. It was 200 things: about signage, about stewardship, about advertising, about staffing, about creative worship. I didn’t have time to tell every person all 200 things that they wanted and perhaps needed to know, so I wrote down them all down. Now everyone can know what we have learned from others, invented ourselves, tried, tested, failed at, adapted and brought to fruition. I also wrote this book because I am huge church nerd. The church saved my life—multiple times. The first time was when I was 4 years old, the daughter of a single mom on welfare in a new community without many supports. The most recent time was when I underwent chemotherapy for an aggressive cancer discovered accidentally that should have taken my life. It would have taken my life were it not for excellent medical care—but, just as importantly, the kind of care that churches are great at providing: casseroles and child care, meaning-making in a difficult world, and most importantly, space to pray and grieve and rail at heaven and experience everyday joys no matter what is going on. I love the church, and as our mainline churches close by the score, I want to do whatever I can to make sure more of them stick around for the long haul, because there are people who need us. Most of those people are not inside our walls, but outside of them. Renewal means a fundamental reorientation toward the people who are not here among us yet—and it’s not necessarily intuitive to us how we will reach them, welcome them, assimilate them. This kind of adaptive change is not easy. It can be very frightening, and the work at times is discouraging. But it’s so worth it. If you don’t believe that it’s possible, come on down and worship with us some Sunday, and see for yourself. Light your candle from ours, and bring it home to your own community. “I’ve read everything, and know that in the bibliography of church renewal, there’s a lot of plain old junk, and there’s also a lot of stuff that is great but falls under the category of what I call “swirly talk.” That is, it provides a great theological rationale, but it doesn’t tell you What To Do. 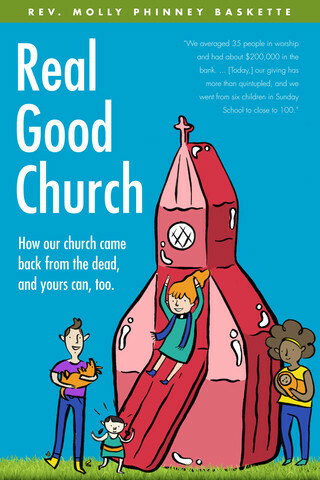 Molly will be selling and signing copies of Real Good Church at the Marketplace at the MACUCC Annual Meeting, on Friday June 13, from 2 - 6 pm.